Cigarguy wrote: For those wanting to stay with Win 7 or 8.1, it's getting more and more tricky. microsoft is reaching new depths. ever since win10 they shifted gears. so right now when you click on the little cross dismissing that annoying pop-up, you're agreeing to the upgrade? what the hell. is that whole company on crack or something? I've hidden KB3035583 and many other annoying spams to many times to count. KB2952664 was reissued again on Jun 8, as an optional update. Yesterday I installed W8 from scratch (from an official Toshiba-USB-stick) , followed by W8.1 update, for a customer. I discovered another "faux pas" by Micro$haft: KB3072318 (Windows 10 Upgrade preparation for W8.1) . Never10 claims to be able to block Win10 upgrade completely, without depending on installing or not installing any particular updates. You can also re-enable Win10 upgrade at any time. Never10 does a mod in the Windows Group Policy. The remark about W10-files on your system only shows if they are there! Otherwise it points to their webpage. It's a great little program. I've been using GWX Control Panel which also works well. I've lost count how many times I've hidden update KB2952664. It was there again this morning on my 2 Win7 machines. nikki605 wrote: I've lost count how many times I've hidden update KB2952664. It was there again this morning on my 2 Win7 machines. I have never had hidden any W10 related KB update, I am just installing Important only. And never get the Windows 10 update notification, unless wanted it by installing all optional updates. Yes, that's a major part of the issue; many people accepted MS' recommendation to allow Windows Update to install all updates just like important updates. I also only install 'important' updates on pre-Win10 systems (and only check for updates manually, never automatic). My X200 has Windows 7 Professional on it, and everything works great. For the last several months, I keep getting the "upgrade to Windows 10" message. I clicked on it to see what it was about, and it started to install. I stopped the install, but several weeks later, it installed automatically. After trying it for a couple of weeks, and several things were not working good, I uninstalled Windows 10 and went back to Windows 7. Now, a month later, I've been getting the message that my copy of Windows 7 is not genuine, and to click this button to correct this. I know they are trying to trick me into reinstalling Windows 10. If Windows 10 is forced on me, I'll probably get Linux, and forget Microsoft. Zorin Linux looks pretty close like W7. That's where I will be heading when W7 becomes obsolete. Thanks RBS. Played around with Zorin a bit and I likey. Really likey actually. Runs great with an old X60T with only a 120 GB HDD and 2 GB ram I had kicking around. Between this and Linux Mint there is some nice alternatives. jdrou wrote: Yes, that's a major part of the issue; many people accepted MS' recommendation to allow Windows Update to install all updates just like important updates. The problem is that not everyone knows how to change the Windows Update settings, which is surprising because I thought most people who frequent this forum would be pretty savvy. Many people also don't know how to disable telemetry options or that they can be disabled, so they keep complaining about how Windows 10 spies on them. DPHMIN wrote: If Windows 10 is forced on me, I'll probably get Linux, and forget Microsoft. Don't worry, July 29 is quickly approaching, after which Windows 10 won't be free any more. And Microsoft has announced multiple times that Windows 10 is the final version of Windows, i.e. there won't be future versions that Microsoft might force people to upgrade to for free. RealBlackStuff wrote: Zorin Linux looks pretty close like W7. You never run software that requires Windows? Five of the programs that I need for my research run only in Windows, and there aren't any Linux, Mac or Chrome/Android alternatives. Acrobat, EndNote, Office, Origin and Photoshop are my only productivity programs that have non-Windows alternatives. pianowizard wrote: Many people also don't know how to disable telemetry options or that they can be disabled, so they keep complaining about how Windows 10 spies on them. We've had this discussion before. Even with all of the above done, W10 still spies on it user. Telemetry can never be completely disabled without applying non-MS hacks. You never run software that requires Windows? ajkula66 wrote: We've had this discussion before. Even with all of the above done, W10 still spies on it user. Just like Windows 8, or 7, or Vista, or even XP. Windows 10 probably does spy 10 - 20% more than Windows 7, but the difference isn't big enough to justify avoiding 10 like the plague, while embracing 7 without reservation. In other words, if you are concerned about 10, you should be nearly as concerned about 7, assuming you are a logical person. I was hoping Puppy would chime in here. A while ago he found an article where Microsoft-hating Linux fans failed to find much spying by Windows 10, after all optional telemetry had been turned off. pianowizard wrote: Just like Windows 8, or 7, or Vista, or even XP. Windows 10 probably does spy 10 - 20% more than Windows 7, but the difference isn't big enough to justify avoiding 10 like the plague, while embracing 7 without reservation. In other words, if you are concerned about 10, you should be nearly as concerned about 7, assuming you are a logical person. But there's so much other stuff with Windows 10 and the subsequent forced upgrade process besides privacy that makes these reservations present in the first place. You do research, right? So then I'm sure you're familiar with the pain in upgrading instrumentation computers to a new operating system just due to general software incompatibility. Granted this happens with every iteration of Windows, but the problem is forced Windows updates on Windows 10 without any method to delay it. Imagine running a simulation or spectral analysis overnight only to find your workstation has restarted itself. There's also more possibility of infinite boot loops, blue screens, random hangs because you can't personally vet the updates. And yes I know there's Enterprise licenses or some special deal where you can delay it, but my institution doesn't have that. Secondly there was a whole fiasco with some computers not being able to load the correct drivers across all manufacturers. Why fix something that isn't broken? It just simply isn't feasible to run Windows 10 in environments where Windows used to work. We can spend hours upon hours to change out the hardware, upgrade to the latest instrument software, etc. or we can just stick with what works and continue to operate. nikki605 wrote: I've been using GWX Control Panel which also works well. I second that. It's simple, clear, and seems to just work. I don't fiddle anymore with disabling this or removing that or registry edits to get rid of the Win10 nag. Personally, I'm running Win10 just fine on a number of machines (only one is in my current sig), and I think it is a good OS, but I use the GWX Control Panel to help family, or for those cases where I don't want to upgrade. Nostalgic for: 600X PIII 850MHz in a SelectaDock III with 64MB Voodoo 5 5500 and Sound Blaster Audigy 5.1. On the W7 installs that I do not want to go to W10 (which is ALL of my W7 systems, since I just made separate HDD installs of W10), I have W7 set to NOT download OR Install ANY updates. It Only Notifies me that they are ready. Then I have to Look at EVERY one, and use the "more info link, which brings up an ms link on what the update actually does. THEN I can decide to let it update or hide it. Any yes some of them keep coming back like a date date. RealBlackStuff wrote: Yesterday I installed W8 from scratch (from an official Toshiba-USB-stick) , followed by W8.1 update, for a customer. That must be a W8 only update. It's not in my hidden updates list and not on my W7 systems. This is a crazy game staying out in front of this. I basically have to have auto updates shut off. cadillacmike68 wrote: This is a crazy game staying out in front of this. I basically have to have auto updates shut off. 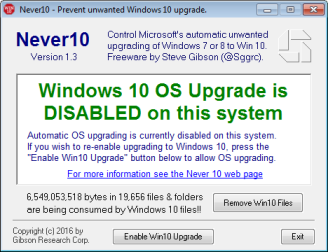 After Never10 came out, which can block Win10 upgrade completely, you don't need to stay in front of anything. Just disable the upgrade and worry not about future updates. Things are as crazy as you want them to be, no more, no less. Anybody with any sense of reality should have stopped Windows Update altogether by now. GWX as posted above works a treat on my Windows 7 virtual machine, on a Windows 7 M90p desktop I sold, and on some other machines. I have not tried Never 10 - no need to. My working machines (M73 Desktop and X1 Carbon laptop) are both Windows 10 Pro 64-bit and both work a treat. No issues. RealBlackStuff wrote: Anybody with any sense of reality should have stopped Windows Update altogether by now. As did I quite some time ago. jdhurst wrote: My working machines (M73 Desktop and X1 Carbon laptop) are both Windows 10 Pro 64-bit and both work a treat. No issues. Glad to hear that W10 works for you with no issues. Seriously. W7 works for me - with WU blocked/disabled/eradicated - perfectly fine. As I've always maintained: to each their own. I am done with Windows update. Every time I installed a Windows OS, the first thing is to turn off the annoying updates, especially for old machines. wekonnoot wrote: I am done with Windows update. Every time I installed a Windows OS, the first thing is to turn off the annoying updates, especially for old machines. Too late IMO...the trust - whatever was left of it to begin with - is gone, at least in my case. I have a T420 retrofitted with a T430-keyboard/trackpoint that I really like (especially with classic dome). my X250 should be eligible for the installation of the mentioned Windows update. Stop W10 from automatically updating SPECIFIC drivers. Did you go daft again by the latest Micro$haft Update that ruined your drivers? Stop that irritating hassle once and for all!